Looking for a composite door price? Composite doors are a modern, sustainable alternative to traditional hardwood with lots of extra benefits. The outer skin is made from a durable glass reinforced plastic (GRP) with a rigid foam core. This means the door is virtually draught-free and soundproof – keeping your home quiet and insulating it up to 6 times better than a wooden door. We have 12 beautiful composite door designs to choose from plus a range of glass and door furniture to complete the look. The Elton Maximise the amount of natural light into your home with The Elton style which offers the largest glazed area in the door range. The traditional aesthetics of this door make it the perfect solution for a back door as well being versatile enough to use for an entrance. The Hartington The Hartington offers a modern and stylish take on a classic 1930’s style front door. The arched top glazing and triple vertical panels help create a traditional and imposing entrance to your home. A choice of modern and classic glass styles ensure this door retains a timeless look. The Newhaven The Newhaven offers the perfect balance between traditional looks and contemporary design. The unique characteristics of horizontal boarding coupled with a long bar handle make this door style an ideal solution for both cottage styles and new build properties. With new triple seal frames, 5 hook lock and 25 year hardware guarantee, you can rest assured that security and lower U-values have been taken care of, whatever the season, with the Eurocell Dales Collection Composite Doors. 10 Year Guarantee Against swelling, de-lamination and colour-loss – you won’t find a more comprehensive guarantee. 25 Year Guarantee Stainless steel hardware covered by our comprehensive 25-year hardware guarantee. Secured by Design Association of Chief Police Officers’ Secured by Design* scheme and the police preferred specifications, PAS23 and PAS24. Money-Back Guarantee £1,000 money-back guarantee in the unlikely event of a break in, where the lock is the point of entry**. The new Dales Collection Composite Doors combine strength, security and style in a door that requires virtually no maintenance. How do we do it? It’s the composite construction of the door which combines different materials for extra strength, to keep your home warm and secure all year round. On the outside, a robust glass reinforced 4mm plastic (GRP) skin with a realistic woodgrain finish provides the tough face that your door presents to the world. This exterior skin is much less prone to scratching and denting than steel-faced doors, and will never need painting or varnishing unlike a timber door. So whether you’re wheeling in a pram, carrying in a sofa or rushing in from work, your door will resist the wear and tear of everyday life. GRP is also totally weatherproof, so rain, snow or hailstones will have no effect on your door’s outstanding, all-year-round performance. 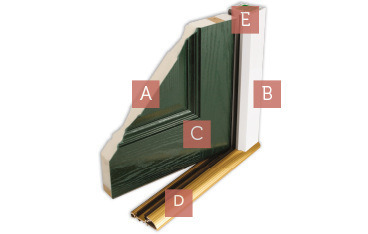 There are 12 beautiful composite front and back door designs to choose from. For a traditional look, try the elegant Cromford or the Art Deco inspired Winster. If you want a more contemporary style, opt for The Bretton, Chelmorton or the Litton. All our composite front and back doors come in a range of colours, from classic Black to vintage Duck Egg Blue or contemporary Moondust Grey. There are over 10 different glazing option to chose from to further personalise your door, plus high quality hardware to add the finishing touches. From vibrant red to tranquil green to subtle grey, the colour of your door makes a statement about you and your home. The Dales Collection of composite doors now gives you a choice of 15 distinctive exterior colours for a highly personal finish. All of our doors are white on the inside as standard, with colour both sides available as an option. Dales Collection of composite doors are available in the following stunning colours. "We would definitely recommend a Eurocell composite door..."
Need help choosing? Just ask. If you have any questions about our UPVC composite doors, or would like to find out an approximate cost, our team will be happy to help. Call us on 0300 333 6525 or use our easy door designer tool. *Excludes doors with toplights, thumbturn lock, unglazed and triple glazed doors. ** Guarantee subject to terms and conditions. Guarantee excludes cylinder. Details on request.